The ‘special relationship’ between the Royal Shakespeare Company and Newcastle is unlikely ever to return to its ‘golden age’, according to its deputy artistic director. A new phase in the almost 40-year collaboration between the RSC and the city’s big theatres has been announced - the first impact of which is no major productions coming to Tyneside in 2015. 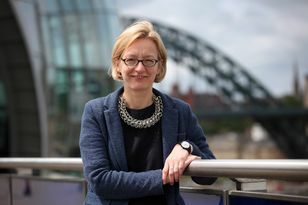 Erica Whyman, RSC deputy artistic director cited a richer cultural offer in the North East as a major factor in the ongoing rethink of the relationship, but she insisted it remained ‘incredibly special’. She also said the new plans for the residency had not been fuelled by cuts to funding. A special touring production of A Midsummer Night’s Dream to mark the 400th anniversary of Shakespeare’s death will open at Northern Stage - where Erica spent seven years as artistic director - in Spring 2016. She said: “I understand people do have a sense of a ‘golden age’ of the RSC coming to Newcastle. “My perception from living in the city was that at that time, people went to three or four shows in a month and then they didn’t go to the theatre much for the rest of the year. “I think a really healthy thing for Newcastle has been that people now go to the theatre at the Theatre Royal, at Northern Stage and at Live year round, because there’s so much good work being presented and produced. Not many people are likely to come to six plays over a month now. The last time the RSC failed to bring a major production to Tyneside was in 2011 when funding cuts suffered both by the RSC and Newcastle Theatre Royal meant the annual residency, which had been established in 1977 to help fulfil the Company’s remit to be a national theatre company, wouldn’t be going ahead. The company returned in 2012 and 2013, and will be at the venue later this month with a trio of productions Henry IV Parts 1&2 and The Two Gentlemen of Verona. But - following today’s announcement - they will be the last main house productions at the venue until at least 2017. There will, however be a First Encounter production of The Famous Victories of Henry V performed for young audiences at the Theatre Royal and local schools in the summer of 2015. Erica said: “I’m really thrilled that we’re coming back to Northern Stage - of course you’d expect me to say that - and delighted to be re-igniting that relationship with the theatre. “I am confident that we’re going to do the same with Live [Theatre] over the next couple of years too. “As well as bringing productions here, there’s been a long history of making interesting new work with Newcastle and I want to get back to doing that. I think you might well see announcements of new work with Live for 2017. “But in no sense is this the end of the relationship with the Theatre Royal. It’s really great that we’ve got such a strong relationship. “We’re there in three weeks time with three shows and I fully expect that we’ll be back at the Theatre Royal with main house shows in the future. Philip Bernays, chief executive of the Theatre Royal, said: “There is no doubt that the cultural sector of the North East - ourselves, Northern Stage and Live Theatre - and the audiences beyond that very much want to continue having a special relationship with the RSC. “The RSC very much want to continue to have a special relationship with Newcastle and the North East. That’s good. “We are in a constant state of evolution and a lot has changed since 1977. We just have to make sure that the kind of relationship we have is one that is fit for the 21st century environment. “It’s a conversation the four of us have been having intermittently almost for as long as I’ve been at the Theatre Royal. It’s a healthy conversation in which we question what we’re doing and why we’re doing it.